PIERCE, Franklin (1804-1869) was the 14th President of the United States (1853–1857), a northern Democrat who saw the abolitionist movement as a fundamental threat to the unity of the nation. He alienated anti-slavery groups by championing and signing the Kansas–Nebraska Act and enforcing the Fugitive Slave Act; yet he failed to stem conflict between North and South, setting the stage for Southern secession and the American Civil War. 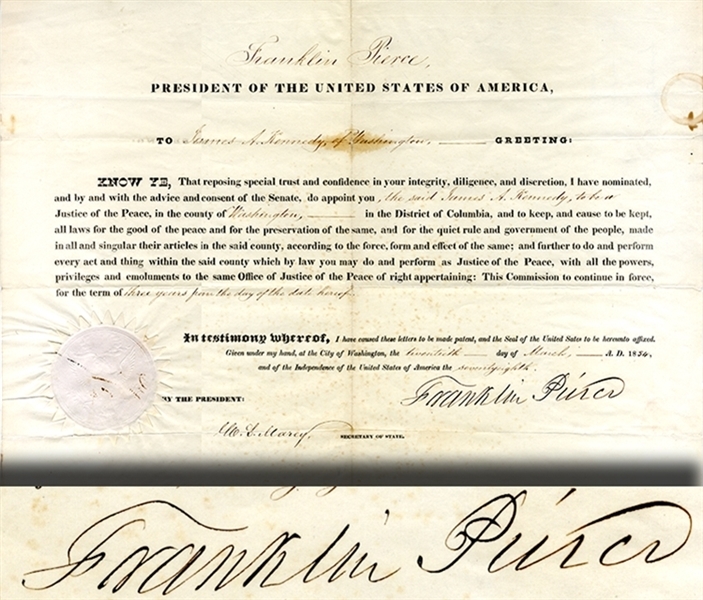 Document Signed “Franklin Pierce” as President of the United States, 1pp. 16-1/4”x13-1/4” March 20, 1854, being an appointment for James A. Kennedy of Washington as Justice of the Peace. Fine condition.